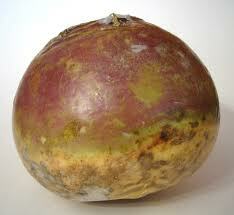 The rutabaga is a root vegetable that looks very much like a turnip with yellow-orange flesh and ridges at its neck. Although this beta carotene-rich vegetable has been grown and marketed in our country for nearly 200 years, it remains an uncommon food in American dining. It's actually a great tasting vegetable with a delicate sweetness and flavor that hints of the light freshness of cabbage and turnip. With its easy preparation and versatility, great nutrition, and excellent flavor, the rutabaga can easily become an endearing family favorite. Because rutabagas store so well, up to one month in the refrigerator and up to four months in commercial storage at 32 degrees, they are available year round. Planted in May and June, they're harvested in late summer and early fall when their flavor is at its peak. Ideally, it's best to shop for fresh rutabagas at farmer's markets in early autumn.